Car Seat Ponchos for 2019 are here with various reversible thick fleece patterns for babies and toddlers! Whether you’re looking for comfortable onesies for your handsome baby boy for when he turns one or trying to perk up the irresistible charm of your baby girl with cute accessories, Birdy Boutique has got your back with a wide selection of baby clothes and accessories! All of our products are the ideal choice for your little ones’ needs since we offer high-quality products that provide you with exceptional value at exceptional prices! We at Birdy Boutique hope to enhance your life by giving fantastic quality products. We now also create and offer adorable car seat ponchos for your little ones so they can experience the joy of a car ride with family SAFELY while even staying warm and cozy on the trip without having to put on a puffy coat! Have you read our Amazon reviews, see below! Our Car Seat Ponchos can be purchased from Amazon.com or our own store. If you purchase directly from our store, you get better customer support, blazing fast delivery and reduced pricing. Links to both Amazon and our own store are placed with products below. With these products, we at Birdy Boutique aspire to keep your children warm and looking their best, whilst being safer! All the products that we offer are compliant with the rules and regulations set down by Consumer Product Safety Commission of the United States of America, making our products top of the line, both in safety and comfort. 1. SAFETY: You won’t have to worry about the safety of your child when buckling your baby over bulky clothing. It goes on your child smoothly over the buckles and seatbelts. Having your child wear bulky clothing, like winter coats and snowsuits are very risky since it can compress in a crash and lead to increased risk of injury for your baby. 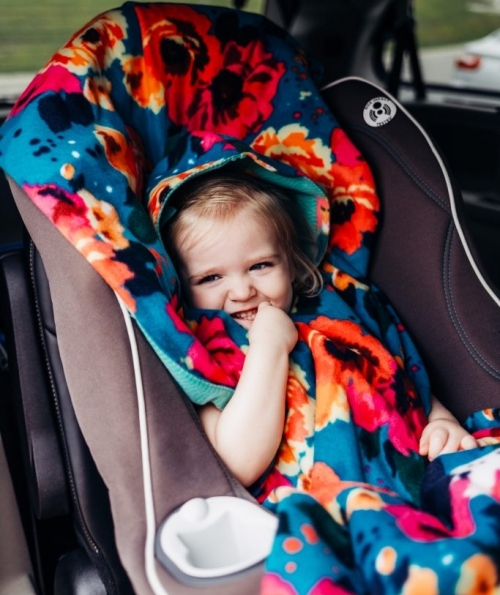 This premium Birdy Boutique Car Seat Poncho eliminates the need for more substantial, bulky jackets stuffed under the car seat harness and remove the hassle of always putting on and taking off a child’s jacket. Instead of taking the trouble of having to put a jacket on, quickly pull this cloak over your child’s head to keep your little one warm and cozy. Don’t believe us, read the the AAP has to say about bulky coats in car seats. 2. TIME-SAVING: The Traveling Poncho slips on over your child’s head, this also provides extra room for a hat if needed, while the rest of poncho spreads over your child’s body for full coverage and warmth. The poncho is made with super warm and soft fleece. It is rectangular and is shorter in the back to prevent bulkiness but longer in the front to provide warmth. Your child has the freedom to move their arms, or keep them under the blanket for warmth. 3. ONE SIZE FITS ALL: Saves you the hassle of finding just the right fit for your child. Unlike a traditional jacket, the poncho fits kids 6-12 months old in car seat up to 4 or 5-year-old walkers and grows with them. 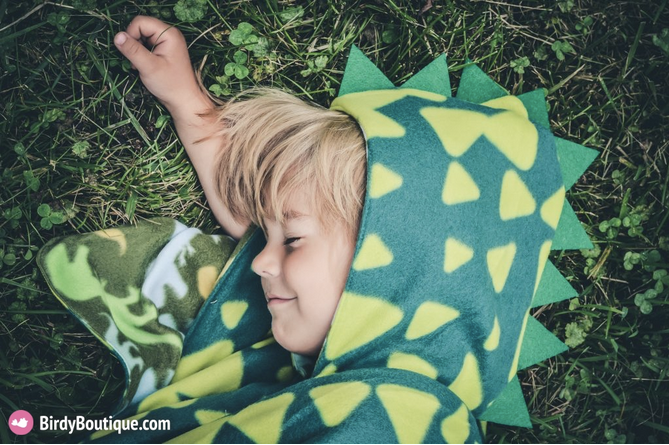 This makes our products long lasting and robust while doubling as the most comfortable blanket your child can have! Parents of new walkers should ensure that the child does not trip on the poncho when walking, as it may be extended. 4. REVERSIBLE: We also offer ponchos that set out two styles in one! Reversing a poncho reveals another unique design to match the adorableness of your child. This provides versatility and value in design like never before! 5. GENDER NEUTRAL: The best ponchos offered for both baby boys and girls! We at Birdy Boutique are always mindful of your needs, and we are confident that you will appreciate the thoughtfulness and work we put in to deliver the best designs for your child to use and wear! All our products are designed with love in the USA by a small company in Michigan! Take a look at the pictures submitted by our satisfied customers! With dozens of ponchos sold to HAPPY MOMS and DADS all while supporting a mom-owned Michigan-based business! We are also women and veteran owned. Providing parents with what they need and children with what they deserve bring joy to our team at Birdy Boutique. We continue to work hard to deliver the best products for your children at reasonable prices while striving to display attractiveness with the simplicity of design. We are always in the process of creating new and unique products catered just for you! We also offer a wide range of other high-quality products ranging from sparkly crowns for your daughter’s birthday to an unbearably cute bow tie for your son’s outfit offered at affordable prices. Pick them up before they’re gone!